We are surrounded by people that we often ignore, intentionally or unintentionally and in return what we get is simple ignorance. What you sow, so shall you reap, stands true in this case. But, have we always ignored the people or we just lack attention? What do you think? By nature, we humans are social animals, and it is a globally accepted fact. A fact or a phenomenon, that’s still a point of discussion. When we aren’t attentive, a probable and a major reason of the same is, these people are those whom we don’t want or aren't supposed to be around with thus making it unimportant for us to focus. We make opinions, we form perspectives about people and things. In other words, we make our lives nothing less than a chaotic circus. Do we ourselves, understand the people around us? Do we understand their mentality completely? Do we know their expectations from us? In the transition from good to being better, formation of a civilized society, creating and living by the etiquette, we have lost the connection, the connection between the people and people. All the stories are very distinct from each other however, the emotions and the commotion within is consistent. The story Homo Coleoptera is about Mr. Ghosh and his love for beetles, which are his prized possession too. A happy and a peaceful marriage, however the confusion and doubt within him about a certain fact, deprives him of the happiness he enjoyed. 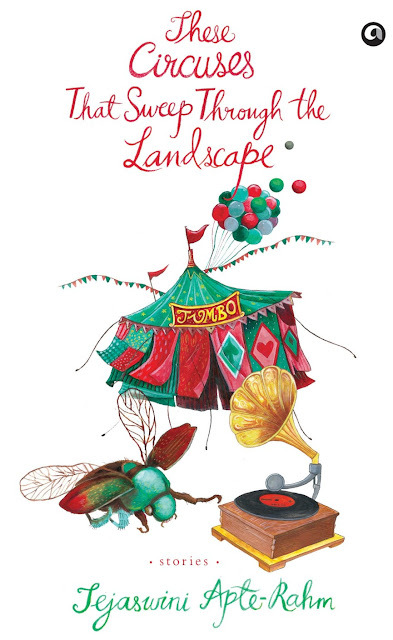 The title story These Circuses That Sweep Through The Landscape is divided into nine tiny chapters which explores different behaviors of human, thought provoking imagination. The human psychology and emotions are at their expressive best and the narration of most of the stories are offbeat. The stories are very much fresh, coupled with wit and crisp. The 157 pages long These Circuses That Sweep Through The Landscape can easily be finished in one sitting. The stories are impressive in parts, revealing in some while the characters cry out in some. I would recommend this book to anyone interested in reading fictional short stories which revolve around various human emotions.